This month we take the opportunity to talk about a sometimes overlooked area of the golf courses, the greens approach. First please note that at the time of re-grassing the South during fall of 2007, the approaches were determined to be 40 feet in depth and grassed with the same Tyee bentgrass as the greens. They would be maintained at a cutting height midway between greens and fairways, which are now the same as the fairway height. This area of the playing surface connecting fairway to putting green is a critical one that can often provide added strategy to the golfer. When conditions are favorable, an approach can be commonly used for a “bump and run” shot, allowing the player to roll the ball at greater length in closing to the hole-location. Depending on the slope of the putting green, the day’s hole-location, and overall firmness of the putting surface, this potentially may prove the only option to achieve the results one desires. Recognizing the importance of this area, the design, physical condition, on-going agronomic programs, and daily maintenance of approaches sets the stage for how they can be utilized in the ground game. Although in most cases golfers only “traffic” an approach as they walk onto a green, in our maintenance operations any approach is an area that receives a significant amount of traffic simply as result of its proximity to the entities on either side. Unfortunately, it is nearly impossible to avoid collateral traffic overlapping in this usually tight area. This most typically occurs in the form of both green and fairway mowers having to turn by some means at the end of their mowing pass. Another challenge is that the mowing height is higher than putting greens and allows the opportunity for organic matter to accumulate more quickly, coupled with the reality that aeration programs for approaches are not as aggressive in relation to putting greens. It might also be noted that a component that might lead to undesirable performance of an approach is moisture content of the soil. In older and less sophisticated irrigation designs, sprinklers that water the putting greens and fairways tend to overlap on approaches, creating the potential for overwatering that leads to softer conditions. These concerns each factor into the decision making for our maintenance programs on approaches of both golf courses. Our first priority with approaches is to limit the amount of traffic, particularly turning equipment, to avoid that extra stress created. We accomplish this goal with the use of plastic turning mats for the greens mowers to turn on and keeping the bigger fairway mowers away from the approaches with side to side “clean-up” passes starting at the bottom of the approach, working back into the fairway. The amount of these passes varies with each mowing in an effort to rotate traffic patterns effectively limiting long-term stress. We strive to treat our approaches as similar to putting greens as we can in a number of ways. 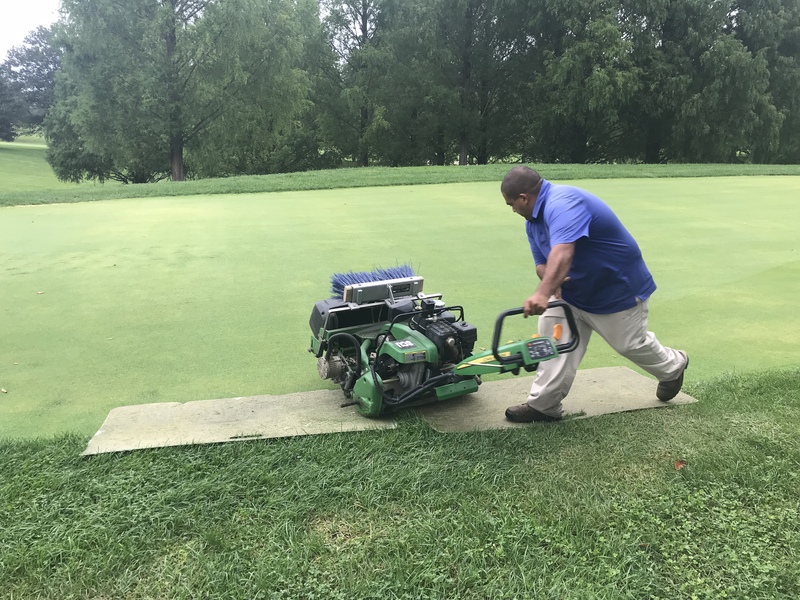 With our aeration program, we are working with the same goal as we do on putting greens to promote improved firmness with core removal and sand filling. 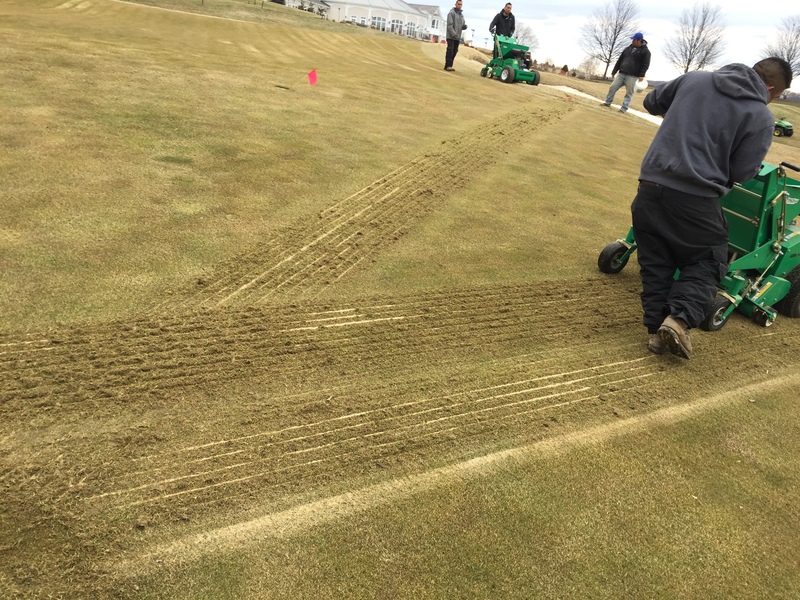 When labor and weather allow, we utilize the sand injection Graden machines to aggressively remove organic matter and replace it with sand in the upper soil profile. Frequent topdressing allows us to continue diluting organic matter between aeration cycles. 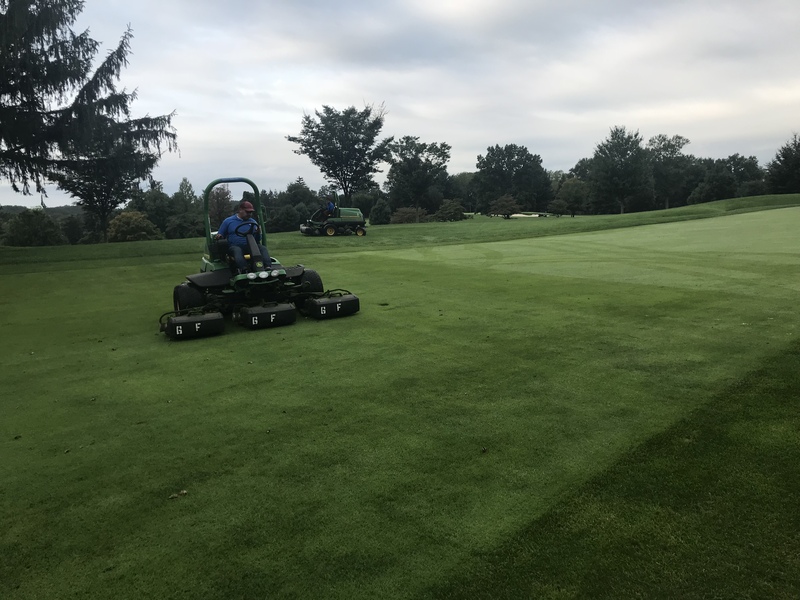 Our weekly practices include mowing the approaches with lighter weight triplex mowers and rolling with the same equipment we use on the putting greens. Another step that we employ is to keep the approaches on the same fertility and plant protectant spray programs as the putting greens. As our irrigation system does fall into the category of older, we have taken steps to limit the potential for overwater of these tight areas as well. As we only rely on greens sprinklers for watering in plant protectant spray applications or short syringe cycles, our main concern are the green bank sprinklers that throw outward from the putting greens. In most cases we have limited the use of the front two sprinklers that overlap on the approach. This briefly attempts to describe all of the strategies combined to provide firmer and more consistent playing surfaces that, when successfully accomplished, increase the number of strategies a player has for an approach shot into the putting green and, with more options, a more playable and enjoyable game of golf.